The Great Indian One-horned Rhinoceros is prehistoric in appearance with multiple folds of skin, rivet like bumps and the single 'horn' on its nose. The horn which is basically matted and compressed hair is prized in the far-east for its mythical medicinal properties. Despite strict protection poaching for its horn still remains a major threat.The Rhino's range today is confined to tiny isolated pockets of floodplains and riverine grasslands in National Parks in North-eastern India and Nepal. They live in close proximity to humans and crop raiding has become a common occurrence. The best places to see the Great Indian Rhino are at Kaziranga National Park in Assam and the Royal Chitwan National Park in Nepal. The Great Indian One-horned Rhinoceros is a mythical looking creature. It's multiple folds of skin over shoulders and hind quarters with rivet like bumps give it a prehistoric appearance which is completed by the single 'horn' on its nose. Its large body with belly nearly touching the ground is supported by what appear to be disproportionately short legs that end in three toes. The lumberous appearance is most misleading for the rhino is a very agile mover. As the name implies, the Great Indian One Horned Rhinoceros has a single horn unlike the African (Black and white) Rhinos and the Sumatran Rhino. The horn is basically composed of compressed/matted hair that grows at the end of its snout and is not part of its skull. The average length is around 8 inches and weight about 2 to 2.5kgs, though there is a record of 24 inches from the Indian State of Assam. The horn is present in both sexes and tends to reach maximum length when the individual is in its prime. The horns of males tend to be broader at the base. With age, the horn tends to wear down, crack or split and with most old individuals it is just a small stump. In males the degeneration of the horn is often accelerated by fighting. If lost in a fight, in young rhinos the horn will re-grow, as it tends to grow throughout its life. The rhino has poor eyesight and a fairly good sense of hearing. It is their sense of smell that is most acute. The Indian Rhino has a prehensile upper lip that it effectively uses to gather short grasses while grazing. The former range of the Indian Rhinoceros extended from across the Indus River in present day Pakistan, through parts of Nepal, Bhutan, Bangladesh, and possibly, just beyond. Today these great beasts are confined to tiny isolated pockets of floodplains and riverine grasslands in National Parks in North-eastern India and Nepal. numbers are found at Pobitara wildlife Sanctuary in Assam and Jaldapara Wildlife Sanctuary in West Bengal. A small population was established at Dudhwa National Park in Uttar Pradesh, near the Indo-Nepal border by re-introduction from Assam and Nepal. In Nepal there is a sizeable population at the Royal Chitwan National Park and a smaller reintroduced population at the Royal Bardia National Park. A creature of marshes and grasslands, the rhino will also use contiguous wooded country. 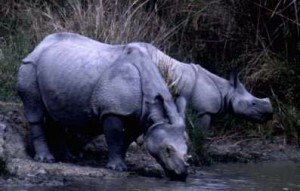 Rhinos are associated closely with the alluvial floodplain of the terai river systems with its typical habitat of tall grasslands punctuated by riverine forests. They are adept at moving through this dense vegetation and forming well-worn trails called 'dandis' in Assam. With regular use, these become high-walled tunnels through the grass. The preferred feeding grounds are the remnants of ox-bow lakes known as 'bheel' in Assam and 'tal' in Nepal. 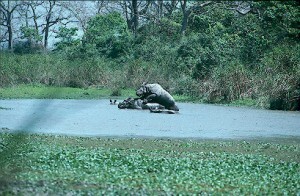 It is along the edges of these large or small water bodies that much of the life of the rhino revolves. Like the Asian Elephant (Elephas maximus), rhinos must spend a considerable amount of time feeding to maintain their bulk. Essentially grazers, rhinos prefer short succulent grasses and new shoots of coarser ones. They also spend a considerable amount of time feeding on aquatic vegetation, and in doing so will completely submerge their head in water to get at vegetation and grasses growing below the water's surface. At Kaziranga National Park, they also feed on the exotic water hyacinth (Eichchornia crassipes) for long hours. When tender grasses are scarce, they will feed on coarse, dry or burnt grass. In forest habitat, they are happy browsing on leaves and twigs. Male rhinos are generally solitary creatures and cow - calf pairs are the norm in rhino country. They occupy a relatively small area for feeding and this too tends to vary from season to season and is loosely held. Dominant males and females with young will not tolerate other individuals too close to them and tend to chase them off. While they prefer their own space, it is not uncommon to see over a dozen individuals feeding in a scattered group. 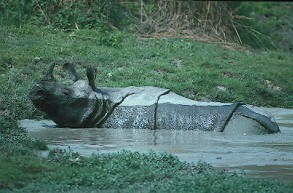 Indian rhinos spend more time in the water than their African cousins. Wallowing in water or slushy pools is a much-favoured activity, and rhinos will often congregate at these points during the hotter part of the day. Despite its deceptive appearance, the rhino's skin is very sensitive and wallowing helps to help protect it from the sun's fierce heat and from insect bites besides it helps to keep cuts and abrasions clean while they heal. Large dung piles or 'middens' are common in rhino country where individuals in a particular area will go to defecate. These communal middens possibly help in advertising the presence of a particular individual in that area as also help resident males in identifying females in estrous in their vicinity. Unfortunately, this predictable behaviour has proved the rhinos downfall - providing poachers a virtually guaranteed result from ambush or trap. Males are sexually mature by the time they are ten years old and females a few years earlier. Dominant bulls tend to occupy a fairly large fixed area or home range and will fight off and drive away other bulls that may stray into this space. This bull will also mate with females in that area when they come into season. Fights are a noisy affair and are fairly common with rhinos inflicting severe cuts and fatal wounds on rivals by biting with their lower incisor teeth, while continuing to chase each other. Chasing is an important part of courtship and precedes mating. Copulation is a prolonged affair and can last over an hour. While it can take place throughout the year mating is most common in the month of March and April. Gestation is 16-17 months and generally a single calf is born. At birth the calf weighs about 60 Kgs (130 lbs.) and are pink in colour. The mother is fiercely protective of her newborn calf, but will leave it hidden in cover while she feeds nearby. Tigers (Panthera tigris) are known to take very young rhino calves. The association between the mother and calf lasts for three years or longer, sometimes even after she has mated again and is pregnant. Calves continue to suckle even after they have begun grazing and are weaned just before the mother is ready to mate again. The horn starts to grow when the calf is about a year old. Unfortunately for the rhino, its alluvial floodplain habitat is also most coveted by humans and the reduction of the rhino to relict or isolated populations testify to the unequal nature of this competition. Today Rhinos live in such close proximity to humans that crop raiding by rhinos has become a common occurrence leaving them vulnerable to hunting and reprisals from local villagers. Proximity to domestic cattle also makes them vulnerable to diseases. Poaching remains a potent threat. The mythical belief in the medicinal use of various parts of the Rhino, and in particular its horn which is said to have aphrodisiac properties and the demand in the early 70s in Yemen for making ceremonial dagger hilts has fed the demand. Even today, Rhino horn fetches such a high price in the market that poachers risk their lives to obtain this. 1. Management and maintenance of habitat condition ideal for Rhino. 2. Reduction of conflict with local agricultural communities. 3. Inoculation of cattle living in proximity of rhino habitat. 4. Intensive patrolling and strict anti-poaching laws and measures.